Something New For I Do is making waves in the wedding industry with their innovative approach to wedding public relations. 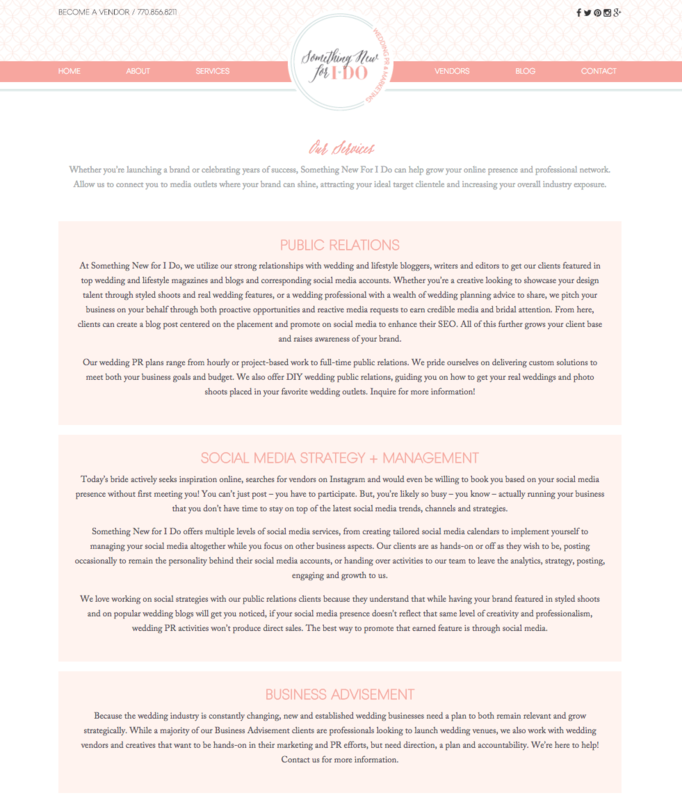 Something New For I Do offers PR services to wedding industry professionals, helping connect planners and vendors gain brand exposure in appropriate media outlets. 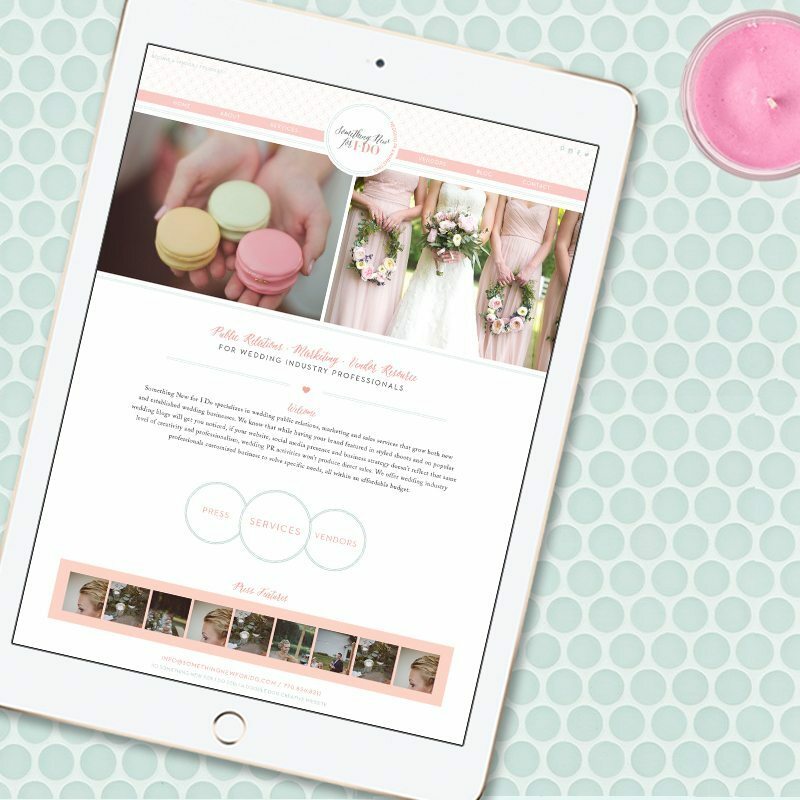 We embraced their innovative idea and feminine style with a new website design in blush and mint. Customized design elements like a pattern and sweet heart accents make their site one-of-a-kind, while press-featuring layouts highlight their impressive PR connections. 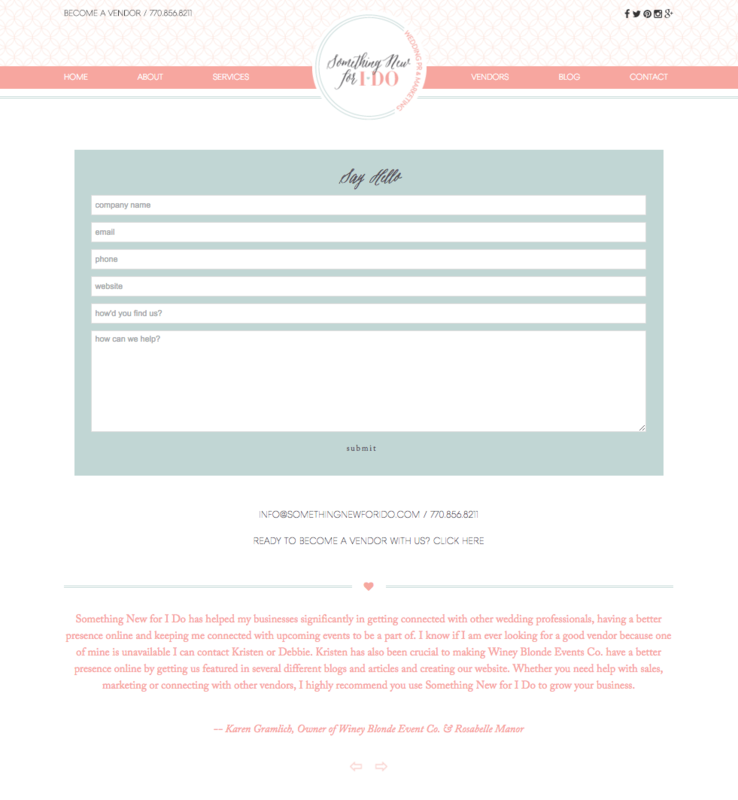 Take a look at Something New For I Do’s new custom website design! We asked Kristen (co-owner of Something New For I Do) to tell us a little bit about her and her business! Something New for I Do is a marriage (pun intended) of our backgrounds. My mom is actually my partner, and she has a background in catering, wedding cakes and the hospitality and professional service industries. And as I was studying public relations and nearing college graduation, we knew we wanted to go into business together, so Something New for I Do was born. We started our wedding PR/marketing company to assist wedding venues who needed help with multiple aspects of their business – wedding planning, sales, marketing/PR, social media, etc. Something New for I Do is now known as wedding PR/marketing firm to vendors and vendor brokers to brides as we’ve been able to build a team of trusted wedding professionals. What is unique about your business? (Why would someone want to use your services) At Something New for I Do, we utilize our strong relationships with wedding and lifestyle bloggers, writers and editors to get our clients featured in top wedding and lifestyle magazines and blogs and corresponding social media accounts. Whether you’re a creative looking to showcase your design talent through styled shoots and real wedding features, or a wedding professional with a wealth of wedding planning advice to share, we pitch your business on your behalf through both proactive opportunities and reactive media requests to earn credible media and bridal attention. From here, clients can create a blog post centered on the placement and promote on social media to enhance their SEO. All of this further grows your client base and raises awareness of your brand. My guilty pleasure is my Pinterest homepage feed because, well, I’ve spent time accumulating the pinners and boards I like and everything on there is just so gosh darn pretty. I also never miss a day without logging onto Instagram, Facebook and Twitter – times however many clients I’m working on that day. Because I blog and do social media work on behalf of other wedding vendors, a large portion of my day is spent rounding out social media profiles and fostering relationships for others. My interest is usually peaked from something I saw on Pinterest or social media, and I read as much as I have time for that day. At the time that I was doing initial research for our new website, I was working on getting one of our styled shoots published on Fab You Bliss. I noticed Doodle Dog did their website, which I loved! Separately, Doodle Dog was also personally recommended to us through another wedding professional, so we knew we would love them and their work. Hands down the vendor listings! 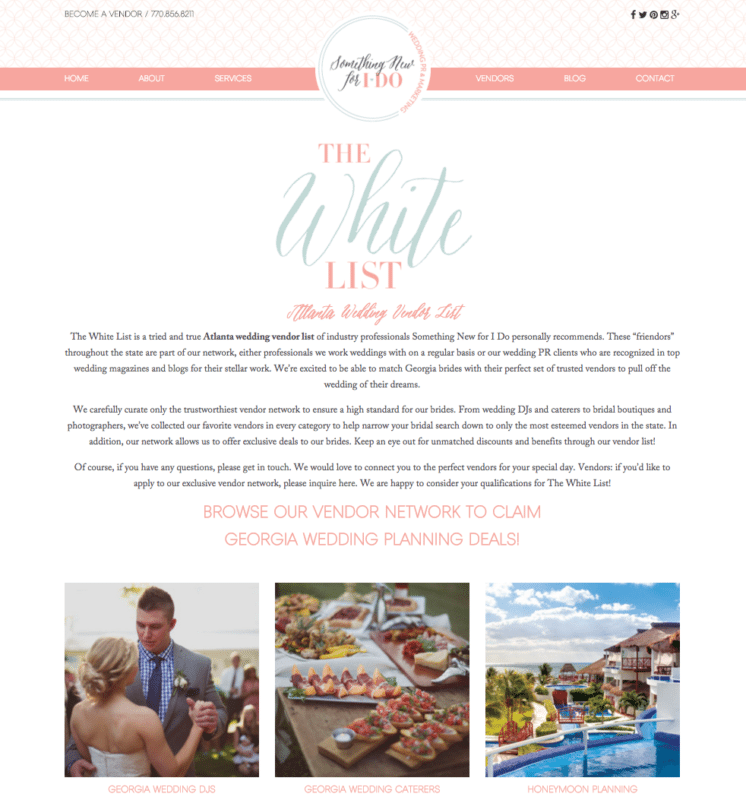 We really wanted The White List to both be a great resource for brides looking for trusted wedding professionals, as well as a place for our favorite clients and wedding vendor friends to showcase their businesses and special offerings. 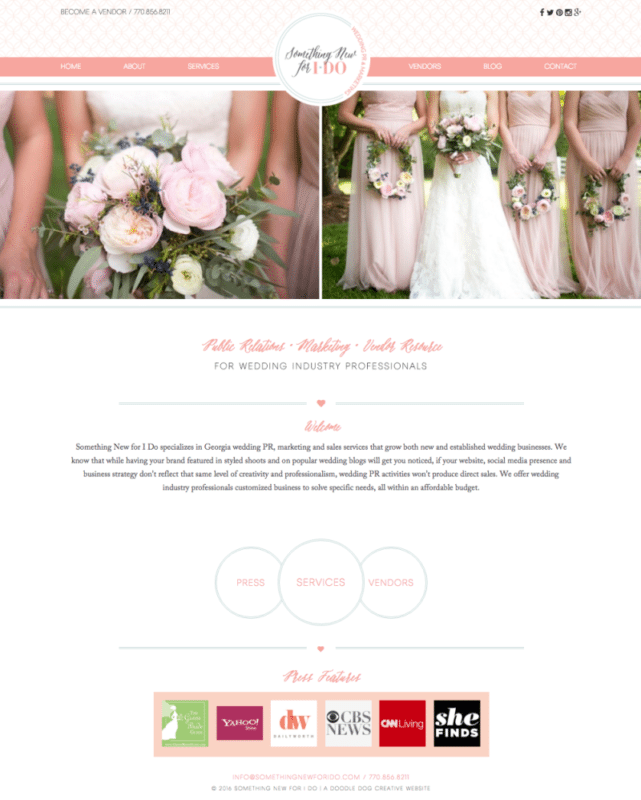 Because we love and have been known for connecting brides to their perfect vendor team, we’re so excited that we can now do this online as well. Having a beautiful, responsive website is key. We’ve all visited a website for the first time and exited in a matter of seconds because it either wasn’t what we were expecting it to be, or worse, the credibility wasn’t there. It will take your brides only 15 seconds to get a first impression of your brand. And first impressions matter when there are endless resources to help them find your competitors. No matter how creative you are or how well you promote yourself on social media, if your website doesn’t reflect that same level of creativity and professionalism, wedding marketing activities won’t produce direct sales. Take a look at the full Something New For I Do website here!